During this activity, pupils drew inspirational pictures of animals, which older pupils used to write short stories. Together, they organized a presentation of their literary and artistic creations. Pupils drew inspiration from a book for children which was illustrated by the author’s daughter. Here, the concept was reversed, as the drawings of animals (penguin, guinea pig, lion), created by pupils of 2.B in Art class, served as a basis for short stories written by pupils from 7.A. The activity was participated by 2.B (22 pupils) and 7.A (15 pupils). 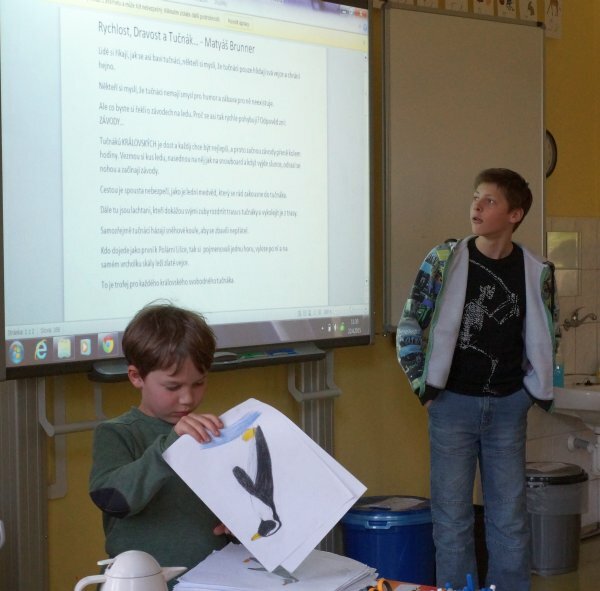 The activities took place during Art (2.B), Computer Science (7.A), A) and Czech Language – Style (2.B, 7.A) classes. The total number of lessons was 10. Preparing of the seventh-graders for this activity took place in Computer Science (2 lessons), where pupils “mapped” specific animals from different perspectives: where they live, how they behave, what are their characteristics, how they look, what they excel in or what are their weaknesses and strengths. To this end, they used online encyclopaedias. Subsequently, the children were given the pictures from the second-graders in PDF and were tasked to pick one which they liked to use as a basis for their short story. The style for the story was not determined, but most chose narrative. The text was written on the computer during two lessons. The computer classroom was used for the project – each pupil worked on their own computer, while the teacher showed instructions through a projector. The children used their skills in working with Microsoft Word – they successfully managed to copy images, write texts using the keyboard and add some graphic editing to it. The resulting works were saved on a shared disk. The joint presentation was held in the classroom of 2.B. It was a unique possibility to connect the children of the first and second grades. Authors of the stories personally met the authors of their images and presented their work using an interactive whiteboard. The presentation took two lessons and was ended by voting of the best work. The children developed their presentation skills, attempted creative writing and showed solid skills in working with digital technologies. I didn´t have enough knowledge. I had a problem. All teachers thought that I have e-mail, but not every one has. I can do everything very well. I didn´t learn anything and it´s a pity. I will think of a better topic. I will think of something more interesting. I will evaluate the tasks according to the teacher. I will draw the pictures better. I wouldn´t také Martin to our group. I will work on my own. I will organize a quieter atmosphere for work. I learn´t how to make presentation in front of other pupils.